Hello my friends! I hope you've had a wonderful week! I'm so thankful that I'm off on Good Friday so I have a nice long Easter weekend to enjoy with some gorgeous weather! We aren't even traveling this weekend so hopefully I can enjoy a little bit of down time! The older I get, the more I need it! lol Well since it is not only Thursday, but the 2nd Thursday of the month, that means it's time for another One Stamp At A Time Blog Hop! This month's theme is Flower Power! Who doesn't love flowers, right?? If you've already been hopping, you should have landed here from the fabulous blog of Melissa Davies! Isn't she awesome??!! If you happened to start at my blog, you'll want to make sure you hop along and check out all of the flower power inspiration of our 15 bloggers by clicking the next button at the end of my post! So for my card I wanted to try a new product... Kuretake Gansai Tambi Pearl. I need a little practice with them but they are fun to play with! 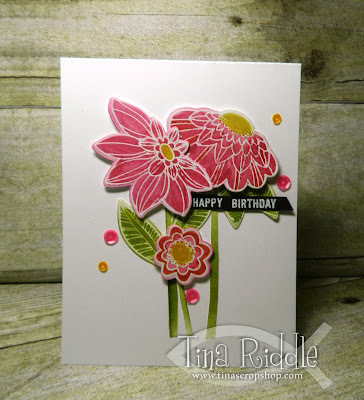 I started off by Heat embossing flowers and leaves from the My Favorite Things Fancy Flowers Stamp Set in white onto Bristol Smooth Cardstock. I used my Kuretake Gansai Tambi Pearl Watercolor Paints to paint in the images. I then die cut with the Fancy Flowers dies . After die cutting I used Tim Holtz Picked Raspberry Distress Ink and inked the edges of the flowers, and Peeled Paint Distress Ink on the edges of my leaves. For my stems I used some scraps of White cardstock and ink blended more of the Peeled Paint Distress Ink and then hand cut some stems. The Fancy Flowers set had stems in the set but I wanted a longer stem and felt like ink blending and cutting would work just fine. I adhered the stems and leaves with Tombow Multipurpose Glue directly onto my Neenah Classic Crest Solar White Card Base. The flowers were popped up with foam tape. 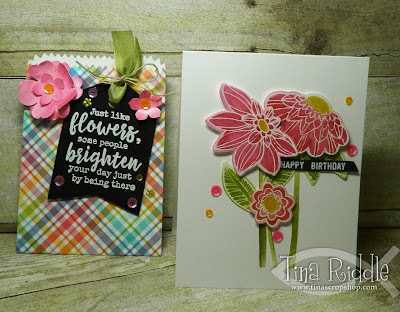 The Happy Birthday sentiment from Stampin' Up! Thoughtful Banners Stamp set was heat embossed in White on Basic Black cardstock and adhered with Tear Tape. I added some Pretty Pink Posh sequins in pink and yellow to finish this one off. It ended up a super simple card but I really love the simplicity of it! I decided for my project to use the Stampin' Up! Mini Treat Bag Thinlits to make a small treat bag as a holder for a gift card. I used the Lawn Fawn Rainbow Perfectly Plaid Paper Stack for my treat bag. I added the awesome sentiment from April's Unity Stamp Co. Kit of the Month for the treat bag. 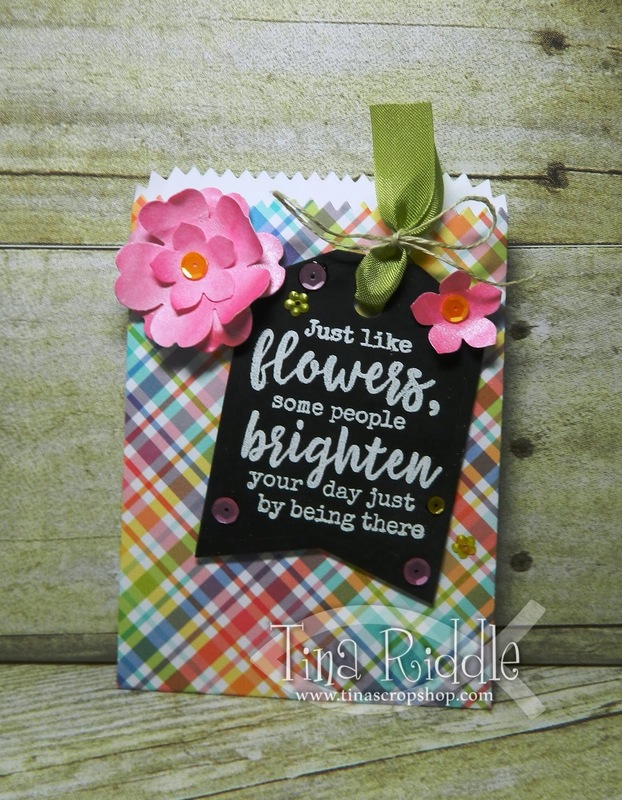 The sentiment was heat embossed in white on more Basic Black Cardstock and then cut into a tag with the Reverse Confetti Tag Me Confetti Cuts Dies. I ran a piece of green seam binding through the tag and tied a piece of natural thread around it. I adhered the tag with foam tape. I painted some of the Pink Kuretake Gansai Tambi Pearl white cardstock and heat set it. I used more of the Tim Holtz Picked Raspberry Distress Ink to Ink the edges and then punched some flowers with the Stampin' Up! Pansy Punch and Petite Petals punch. I used my Bone Folder to add some curve to the flower petals. 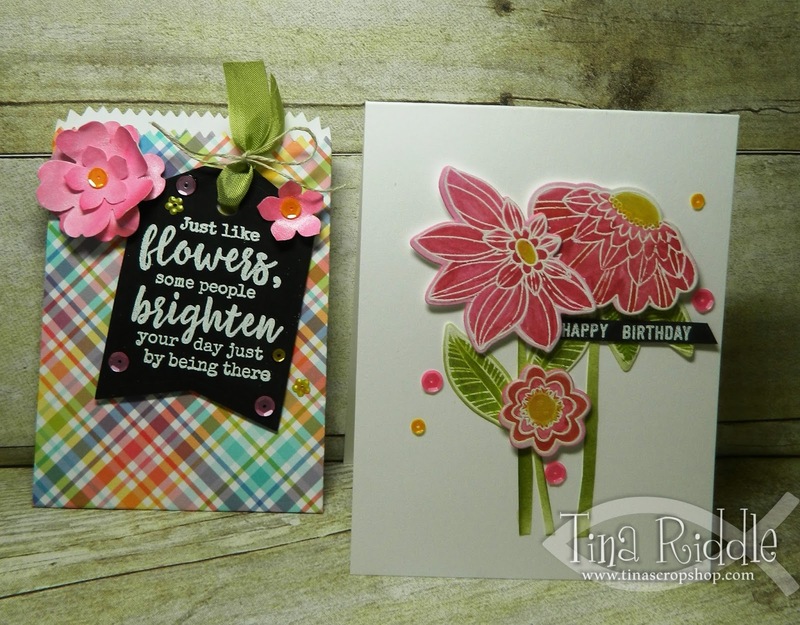 For the larger flower, I layered two of the pansy punches and one of the petite petals punch with glue dots. Once the flower was assembled, I added it with foam tape to the front of my treat bag. I added a yellow pretty pink posh sequin in the center. The small flower was a one layer Petite Petals punch that had a yellow sequin in the center. I then added several Pretty Pink Posh sequins in both yellow and pink to finish this one off. Thanks so much for stopping by! The next stop on the hop is the talented Pam Staples! Just click the next button and you'll be there! Labels: April 2017 Kit of the Month, Birthday Card, MFTStamps, My Favorite Things Fancy Flowers Stamp Set, OSAT Blog Hoppers, Stampin' Up! Mini Treat Bag Thinlits, Unity Stamp Co.
Beautiful! Love the bright Spring colors!